I absolutely love hydrangeas. Whether they are blue, green, white, purple, or pink, they are one of my favorite things about summer. They were one of the first shrubs I ever planted in my yard (after the one I discovered in my back yard quickly died from overgrown ivy during the first year), and thankfully, they are growing back strong this year. I should also mention that when it comes to outdoor gardening, I do not have a green thumb. I’m not even much of a fan of gardening, really. But my hydrangeas are still healthy, blooming, and happy. 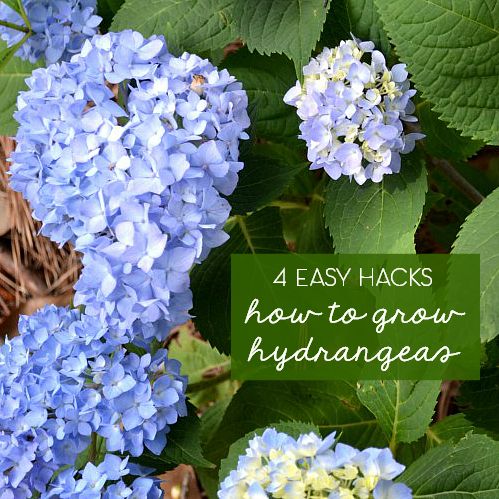 So based on my minimal expertise, I’ve created a small list of tips for growing hydrangeas that have worked for me. My parents had a mature hydrangea bush growing in their back yard by the kitchen door. And by mature, I mean huge. These things can get very, very large, provided that they have enough nutrients in the soil and are protected from the wind. So, my first tip is to know where to plant them. There are several varieties out there, some that tolerate sun a little more, and some that are designed to bloom frequently. So it’s best to just read the label when you buy them from a nursery. Mine mentioned that they liked shade and should be kept out of the wind, so I chose two spots around the house that met this criteria: the front yard near the camellia bushes (there are large trees that keep this little island in shade most of the day, and the camellias would also serve as wind-blockers) and directly behind the house along the empty garden bed (you can read more about that makeover from last fall here). The back yard is almost always covered in shade thanks to large pine trees, and by growing close to the house, the shrubs would easily stay protected from wind. Since I live in Georgia, the toughest part was finding places that they would be protected from the hot sun, but I believe colder climates can have them in full sun without killing them. When planting, you should also give them plenty of space to grow. They will seem a bit sparse at the beginning, but giving them the proper elbow room now will let them fill in over time with new blooms. The ones I planted in the back are still a little close together to be permanent (you really should have a few feet between them), so my plan is to transplant the one(s) in the middle when they begin to mature. Seriously. Leave them alone. Other than fertilizing them occasionally (cough cough, the day I planted them and then never again, cough), they can do just fine on their own. Once “established” (and as a novice gardener, I never quite know when that is, but I just assume that if it’s growing new leaves or getting bigger in any way, I’m in the clear), they are quite hardy. In fact, my neighbor even cut the hydrangea in the front down to nothing a couple of years ago after mistaking it as a dead plant (he did a big yard cleanup for me and insisted it was dead, but hydrangeas look like dead sticks during the winter). It still grew back, and I was relieved to see new blooms the next year (I expected that a close shave like that would mean no blooms the next year while it recovered, but I guess it was just good timing). During the winter, hydrangeas look like crap. They look like they died and will shrivel up to brown, spindly sticks. Sometimes that’s true… but again, see above rule re: let them be. 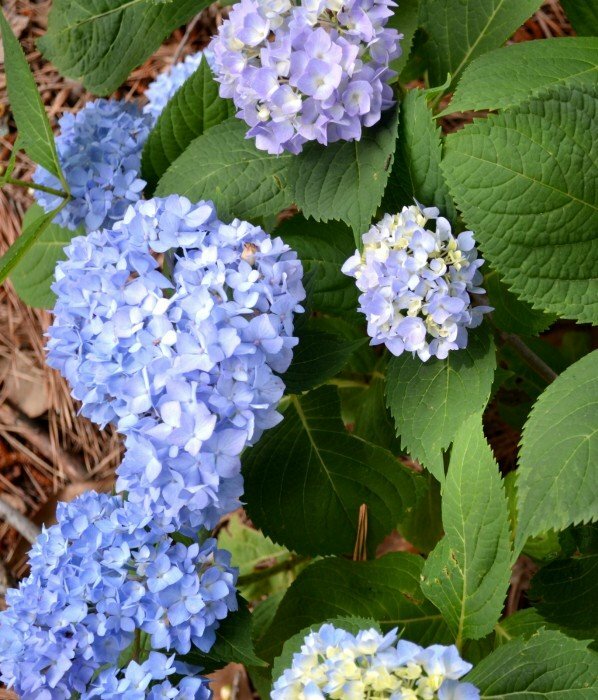 Unless they are too big for the spot, hydrangeas don’t actually have to be pruned. You will be surprised that most are, in fact, not dead. And by trimming them back, you run the risk of them not blooming the next year (because I simply just don’t pay enough attention as to when they can successfully be pruned, and by the time I look it up, it’s usually too late for the year). It may be ugly, but tough it out. Blooms form on new growth, so once you see the plant returning and greening up again in the spring (try to wait until about May), you can remove anything that still looks dead. I don’t really care about the color of the blooms, as long as they aren’t brown ;). But if you’re going for blue, one of the best tips I’ve heard is to cover the base with pine straw. The natural acidity from the pine straw helps them to bring out the bluer pigments. I haven’t really bothered to do this with mine, but pine straw is a natural occurrence around this house with so many pine trees (in fact, I fight to keep a minimum of it around). If you don’t have an overabundance of pine straw like I do, I’ve heard that coffee grounds, eggshells, and other composting matter like citrus peels can up the acidity considerably. I chose to cover the ones in the back yard with rubber mulch last fall (I’ve got a cedar-sided home and putting regular pine bark mulch so close to the house is a bad idea), and they’ve all grown in more pink (and as you can see, pine straw fell on top of the mulch over the winter). The one in the front yard has a natural covering of pine straw for the last few years, and it’s bright blue. So even though it wasn’t on purpose, there may be some truth to the theory. I haven’t yet pruned any of my hydrangeas yet (or have a need to, since they are still young), so that’s about all I’ve got so far. Do you have any of your own tips for keeping your hydrangeas healthy? I’d love to hear ’em. I planted my first hydrangea this year and I gave my mom one for Mother’s Day. I don’t think either of us care what color ours are but hers will be covered in pine needles so I will give her a heads up about that! Thank you! First off, I am the furthest thing from a Hydrangea expert. This is all based on my experience with planting them because I love them also. It depends on the variety of Hydrangea whether they bloom on new wood or old. Most of yours look like “Endless Summer” or some variant of that and those bloom on both new and old wood. (These are the most common variety sold at both Blue & Orange, and sometimes Kroger too.) If you have a variety that blooms only on old wood (ie “Lady in Red”) then if you chop it down every winter then you will likely never see blooms. The plant tag from the store should indicate whether it blooms on old or new wood. Wait until the spring and then snip off any branches that don’t leaf out as some will certainly die (especially when you have a cold winter like this one was). Also, some varieties will change color depending on the acidity of the soil, I’ve heard that it’s easy to get them blue, but back to pink is quite difficult. I believe coffee grounds will do the trick to turn them bluer also. Usually oak leaf and lace cap varieties tend to stay one color while the mopheads are more susceptible to changing color based on soil acidity. Anyway, now that I’ve made myself sound like a big giant nerd – your Hydrangeas are gorgeous! Wow, LOTS of great tips! You’re right, mine are endless summer, both in the front and the back, so I guess getting the pinky-lilac ones in the back were pure accident! like Endless Summer. Can’t wait to get an old fashion paniculata hydrangea …beautiful! Thanks for the great info. I bought a nice-sized plant just before Mother’s Day and have kept it in a pot cause I wasn’t sure where it would be happiest. Since there is only one place in my yard where it will be sheltered from our often 40mph wind, I now know where to plant it. Again, thanks! I have a hydrangea that I planted in full sun and it has been quickly withering… obviously the sun is too much! I’ll have to replant it. Thanks for sharing!